Long stretches of soft white sand, rugged coves, spectacular dunes, sparkling pebbles and grains of rice: the variety of beaches in Sardinia is so diverse that you are not likely to be disappointed. The clear blue sea that laps the shores of the island is an invitation to dive, to savor this precious good that nature, in Sardinia, offers so generously. The beaches of Sardinia are so many and so different as to make the choice almost embarrassing. That's why we decided to enclose the most beautiful on this page, the ones that are well worth a stop during your trip. 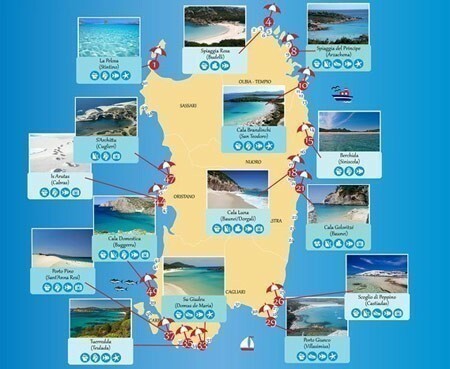 In this handy infographic you will find the most beautiful beaches of Sardinia; share it and bring it with you during your holiday in Sardinia! The best beaches in Sardinia divided by province: discover the best beaches to experience during your next holiday in Sardinia! A paradise beach at the feet of Capo Falcone. Located in front of the wild island of Asinara, it boasts exceptionally white fine sand and transparent turquoise waters. In front of the beach stands a 17th century watch tower, adding the finishing touch to an iconic landscape. Situated in the area to the south of the wild ‘island within an island’ of Budelli, its name comes from the pink hue created by tiny fragments of coral and shells. The surrounding waters are emerald green. The beach can be accessed only from the sea and visits require the presence of an authorised park guide. 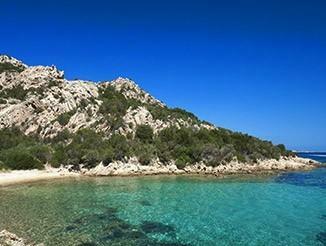 The favourite beach of Prince Aga Khan, the founder and sponsor of the famous and much frequented Costa Smeralda. The shore appears as a bow of fine sand contained in a frame of various shades of pink, and there is a great rock dividing it in two. Accessible by a short 10-minute walk. 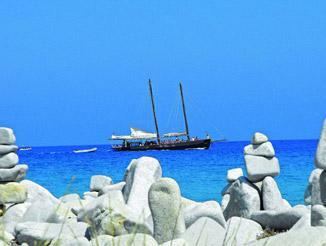 Known as the ‘Tahiti of Sardinia’ due to its exotic aspect, it is situated at Capo Coda Cavallo. It has fine white sand and shallow waters of deep turquoise. The beach has formed dunes where Mediterranean pines, junipers and wild lilies grow. Discover the best hotels in Costa Smeranda to visit these beaches! Known also as ‘rice grain beach’ due to its grainy sand, formed by fragments of quartz. The sun creates unique reflections of pink and light green. Ideal for peaceful sun-bathing and much frequented by surfers. This beach has featured in many Italian films and was home to the World High Diving Championship in 2001; it takes its name from the high, spectacular natural natural rock arch which dominates the bay, no less than 15 m high. During the summer months it is lighted at sunset, creating a magic romantic atmosphere. A decidedly adventurous trip awaits visitors deciding to reach this angle of paradise. Declared an ‘Italian National Monument’, it is one of the gems of the Mediterranean thanks to its snow-white pebbles and crystal-clear waters. Situated in an ancient mining area where it is still possible to see the ruins of industrial architecture. Its sand is mixed with gravel and rock, and its sea has many hues of blue, with a Spanish watch tower looming on the horizon. Easily accessible by car through breathtaking scenery. Marked by transparent waters and the calm atmosphere typical of a desert. The sand is glistening white and the countryside is dotted with the rare Aleppo pines. The beach is bordered by wetlands, home to the pink flamingo, similarly to many other beaches in the south of the island. Set in the southernmost part of the island, its sand is golden and it boasts tall natural dunes. On the horizon are two small islands which can be explored on foot. 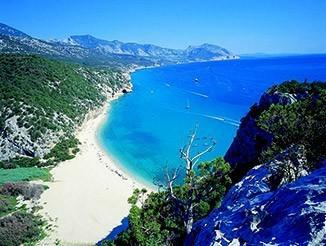 Situated at Capo Spartivento, it has a ‘V’ shaped shore and is famous for its fine white sand and crystal-clear waters. The beach is framed in low Mediterranean brush vegetation; facing it is the small island of Tuerredda which visitors can access with a short swim. It can be busy in the summer months. From a large wood of pines, visitors can easily access this beach, well known for having two different ‘seas’, the blue waters of the sea and wetlands of the Notteri Marsh, where the pink flamingos breed. Part of the beauty of Costa Rei, it has a spectacular flat rock which emerges from the waters like a great turtle. The beach is framed in perfect white dunes and a juniper wood. The waters are transparent and shallow. Discover the hand-picked hotels we have selected for you, browse our selections of beach hotels!